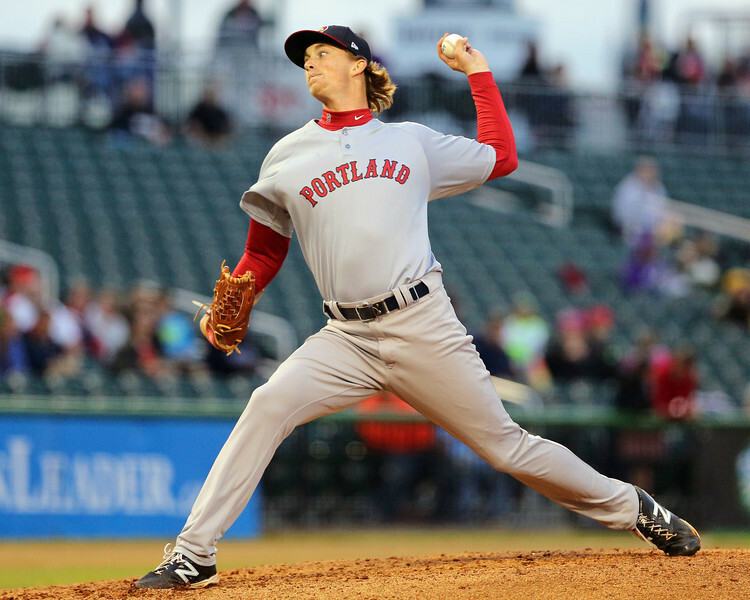 6/5 Cup of Coffee: Pawtucket won an extra-innings shootout while Portland was victorious behind a strong start from Henry Owens. Greenville and the DSL Red Sox fell while Salem's contest was tied when suspended in the fourth inning. The Pawtucket Red Sox defeated the Durham Bulls (TB) by a score of 8-7 yesterday in an 11-inning contest. We pick the game up in the top of the ninth inning. With the PawSox down 7-4 entering the frame, a late-inning rally was needed to keep the game alive. After a pair of walks to lead off the inning, Shannon Wilkerson singled to load the bases with no outs. Some hope was dashed, however, after the recently promoted Mookie Betts (pictured, left) grounded into a double play, although one run scored to make the game 7-5. Garin Cecchini then drew a two-out walk, which brought up Ryan Roberts with two men on base. Roberts doubled, scoring both runners and tying the game. After a few scoreless frames on both sides, the PawSox were able to take the lead in the top of the 11th inning on Betts' first Triple-A home run. Rich Hill, who came into the game in the bottom of the ninth, pitched a 1-2-3 bottom of the 11th to nail down the win. Betts was 3 for 6 in the game with two runs scored and an RBI. Starter Allen Webster pitched a fine game, going six strong innings and scattering seven hits and allowing just one run. 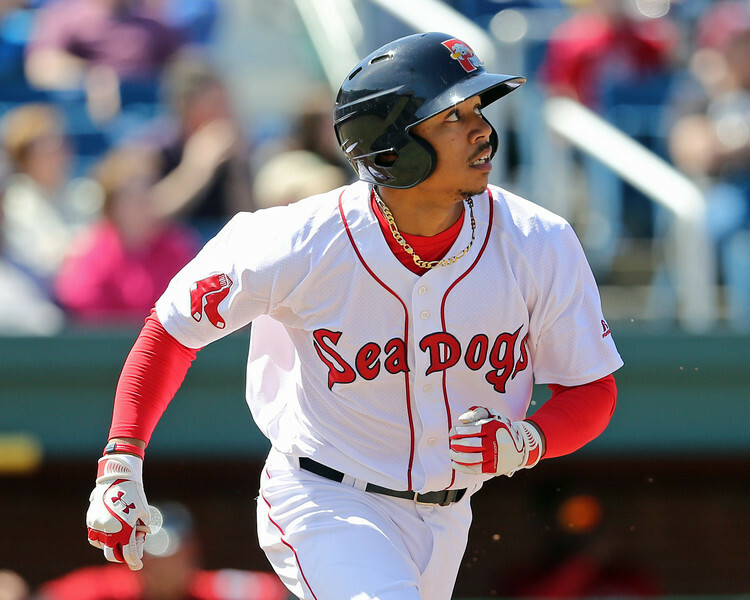 The Portland Sea Dogs topped the Erie SeaWolves (DET), 5-1, thanks to a dominant Owens. The lanky left-hander continued to show why he is widely regarded as one of the organization's top prospects with Wednesday's outing. He went eight shutout innings, delivered 107 pitches (73 for strikes) while surrendering only two hits and walking just two. He finished the game with six strikeouts. On the offensive side, Owens' teammates gave him a quick lead by scoring in the bottom of the first inning on a lead-off solo shot from Bo Greenwell. Portland would get the game-winning run in the bottom of the fourth inning on a run-scoring single from Derrick Gibson. Three more insurance runs came across in the bottom of the eighth thanks an RBI-groundout from Gibson and a two-RBI single from Blake Swihart. The Frederick Keys (BAL) and the Salem Red Sox saw their scheduled contested shortened by rain. When the game was suspended after the bottom of the fourth inning, the score remained tied at 4-4. So far in the contest, second baseman Reed Gragani is 2 for 2 with two doubles, a run scored, and an RBI. The game will be completed today, June 5. Not a lot went right for the Greenville Drive Wednesday as the team fell to the Lexington Legends (KC), 9-3. It was a rough day for starter Jamie Callahan, who was tagged for five runs and 10 hits in five innings. Callahan did a good job of limiting the damage through four innings, only giving up two runs, but the Legends were able to score three more in the fifth, which proved to be enough for the win. The Drive offense mustered eight hits, three off the bat of catcher Jordan Weems, who had the only two extra-base hits on the night -- a double and a triple. Left fielder Kendrick Perkins collected two hits, raising his season average to .306. Greenville's defense was also lackluster as the team committed four errors in the game. The DSL Red Sox fell to the DSL Nationals by a score of 11-9 in just their fourth game of the 2014 season. The Nationals grabbed a 3-0 lead after three innings, but the Red Sox would answer back with their first run in the bottom of the fourth on a passed ball. The Nationals then scored four more in the top of the fifth, but the Red Sox answered back with three of their own to bring the score to 7-4. The Nationals plated two more in the sixth, and the Sox scored three in their half to bring the score to 9-7. The Red Sox scored once in the eighth to bring them within one, though the Nationals answered back with two of their own in the ninth. The Red Sox' comeback fell short in the ninth, as they managed to plate only one run and leave the bases loaded to end the game. Three players collected three hits apiece: catcher Roldani Baldwin, who as 3 for 5 with a pair of runs and RBI; second baseman Luis Benoit, who was 3 for 4 with a walk and two RBI; and left fielder Juan Hernandez, who was 3 for 5 with a double. Player of the Day: Portland starter Henry Owens (pictured, right) is back to being locked in on the mound after experiencing a bump in the road in late-April. In his start against Erie, Owens was dominant and gave up only two hits in eight shutout innings. In his last three starts, Owens has gone at least seven innings and has surrendered no more than four hits in each outing. In 22 innings over that span, he has struck out 17 and walked only five. Photo Credit: Mookie Betts and Henry Owens by Kelly O'Connor.